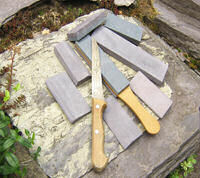 Enjoy the pleasure of working with sharp, well-honed tools. We carry the world's best whetstones and tool sharpening systems so you can save time, work more efficiently and keep your tools lasting longer. Hollow grinding is a preferred way of creating the shape on the edge of tools. Framing chisels, draw knives, cabinet maker and woodworker chisels, knife and planer blades and other tools can be shaped on the Tormek water-cooled wheel sharpening system using jigs designed to hold the tool accurately and save your knuckles. Once hollow-ground, the front edge is quickly and efficiently honed on our Belgian stone. Having only a small leading edge bevel allows repeated honing of just the edge without a major tune-up of the whole edge side of the tool. If there ever was a secret to getting a tool sharp, it is to start with the flattest undulating intersecting lines of the two edge sides. You can achieve that with a micro-bevel using our Belgian stones, then hone with the famous Original Escher stone or swipe on a leather strop, or use the leather wheel of the Tormek with a rubbing compound for just a few seconds.